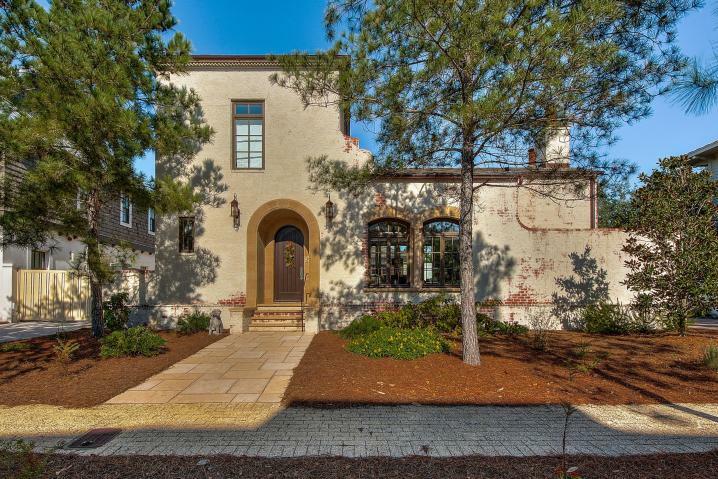 A sophisticated aura encompasses the interior spaces of this Mediterranean courtyard home with private swimming pool in Rosemary Beach with rich earth tones, dark wood accents and arched doorways. Nestled on a large homesite only steps from the community amphitheater and owners pool, this three-bedroom residence offers flexibility with the potential for a carriage home to be built over the two-car garage. 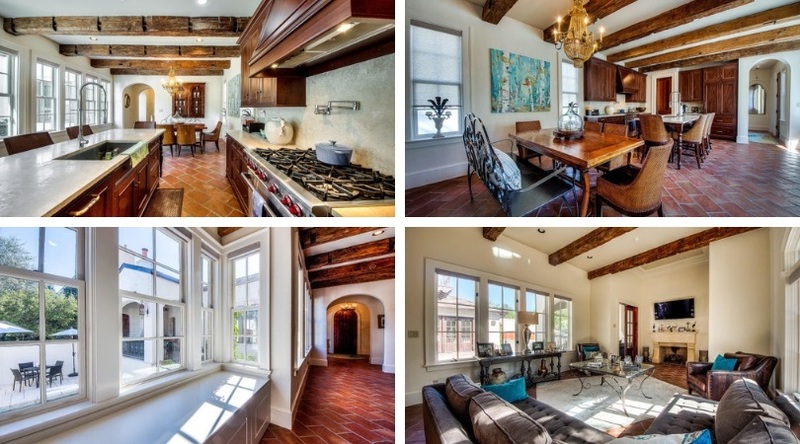 The welcoming living room features airy 12’ ceilings with wood beams and a cozy fireplace. French doors lead to a vaulted covered porch with a wood burning fireplace overlooking the private courtyard with ample space to play and enjoy refreshing dips in the pool. The spacious and beautifully appointed kitchen offers a large island, gourmet appliances and a walk-in pantry. 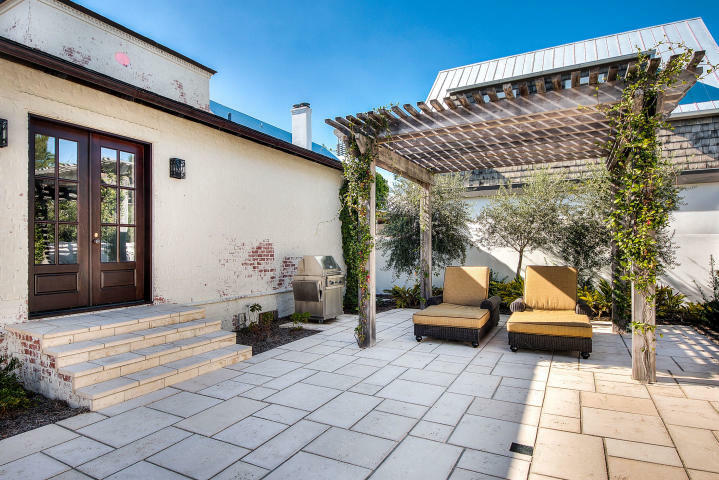 An elegant first floor master suite overlooks the courtyard with direct access through French doors to a large patio with pergola, fountain and dedicated grilling area. 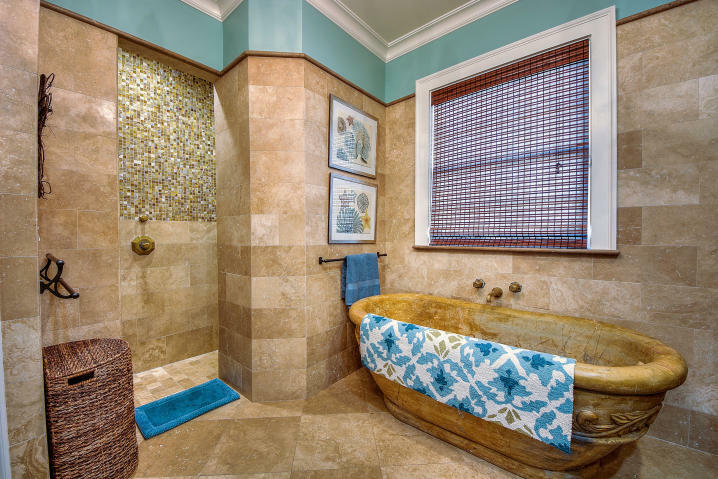 The luxurious master bathroom includes a separate soaking tub and large tiled shower. Lounge under the pergola in chaises while you enjoy soaking up the bright Florida sunshine. Upstairs, find two bright and spacious guest suites each featuring a private bathroom with beautiful tile work. This home is being offered fully furnished and move-in ready with outstanding curb appeal in an outstanding community location. Rosemary Beach is a welcoming beach town designed to reunite the concepts of community and connectivity in a quaint town setting. Designed by Miami-based Duany Plater-Zyberk and Company, Rosemary Beach embraces the principles of traditional town planning with a pedestrian friendly design. With its brick-lined streets, charming town center, unique shops and locally-owned cafes, locals and guests alike delight in this picturesque community. Whether enjoying the weekly farmers’ market, a lively game of catch on the town green or dining alfresco under the stars, memories made here last a lifetime.